Norton Bootable Recovery Tool is a handy piece of software that will create a customized rescue boot disc to help you back up and running fast if your PC’s operating system becomes so infected that it won’t boot up or your Norton product cannot install or start. 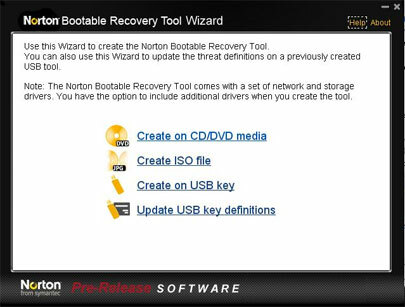 When you first install your Norton Security Software, be sure to take a moment to download the Norton Bootable Recovery Tool wizard and follow the simple steps to create your customized rescue media. Your customized copy of Norton Bootable Recovery Tool can be used to start your computer in a safe environment, then remove the threats that caused the problem.